On occasion, I go over to Goodreads and look at all the books I have read over the years. When I was getting ready to start this review, like always, I go to Goodreads to get the information I need for the post. Well, I got to looking at the previous books of Amity's that I had read (BTW, it's all of them). My first review, was all the way back in the early fall of 2012. Thank you for being such an amazing author that you have kept me wanting more of your book for (close to) two years!! Your talent is something I don't think I could put into words!! Thank you!! Let's talk about the new Amity Hope book!! 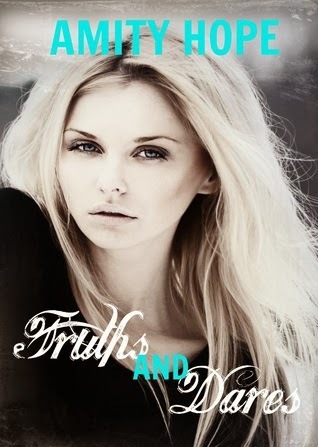 What I liked: Amity Hope has a a great writing style. It never too descriptive that I know ever single color of the walls in the room, but it's enough to know that when there is pain and/or hurt, I want to cry! This story is much different than others, Harper and Seth. They are the best of friends growing up, and the each (truly) love each other. Seth....oh, Seth....I instantly fell in love with him, and as you read on his story becomes...well, he changes a bit. See, Harper moves away, and Seth is really torn up about it. And I want to tell you everything, but I'm not going to spoil it for you. HOWEVER, I will say this....keep reading!!! The hold/pull/life line that those two have on each other, is truly a beautiful story. It's not ALL kissy, kissy, mushy, mushy..that you just want to gag from it! Amity is too amazing for that! So, don't think that going into this story. Through some of it I forgot they were teenagers! What I didn't like: As much as I love Amity, I think she might have been close to a deadline. Because the last couple chapters, I felt to be a little face-paced. NOW, I don't know if she meant to do that BECAUSE we are left with a cliffhanger, so it may have been intentional. But, that is the only true dislike I had with it!! I would RECOMMEND this BIG TIME! !